Well dear readers, mistakes were made. Remember when I painted the walls of my kitchen three times before I was satisfied? Remember how when all my instincts were screaming MISTAKE MISTAKE I just soldiered on, sure that when all was said and done it would be just fine? So, back to the drawing board. I have a few more samples I’m considering (though it’s hard to get a clear read on them with the current wall color – everything is cast with a blue light). Adding a little stress to the decision-making process is that Miller Paint has a 40% off sale running through Monday, so there’s a strong likelihood that as you read this I am sweating bullets and trying to make a decision in time to get the savings. In happier news, I decided to make good use of the fact that our living room is partially empty and do a little treatment on our wood floors (this had the additional benefit of forcing me to take a break from frenetically putting sample after sample up on the walls). 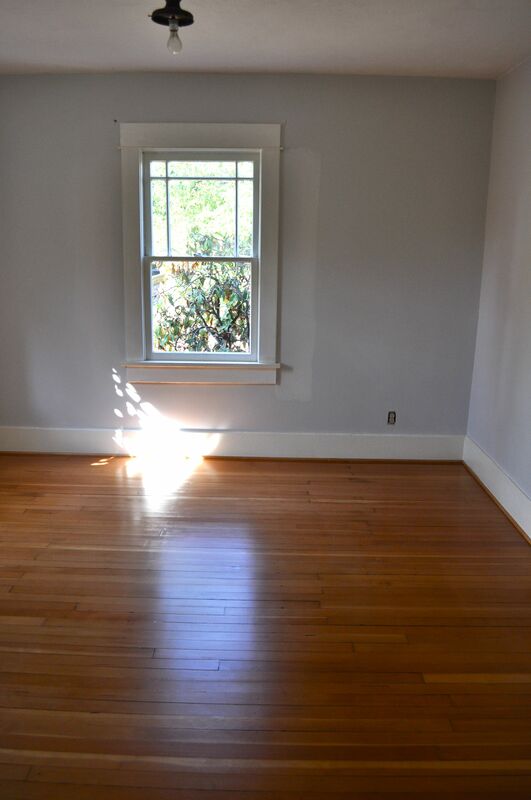 Our floors are fir, and original to the house when it was built in 1930. They are in good shape but definitely show the wear of the people and pets and children who have lived here. The process was simple. I gave the floors a thorough cleaning (the product forms a sort of seal, so it’s important to get every last bit of cat hair up before using it). When the floors were dry, I just poured it on a small section then spread it around with a damp sponge. It was easy, not fume-y and is a marked improvement. With the small victory of the floors, I feel a bit more prepared to move forward with painting the walls. Again. 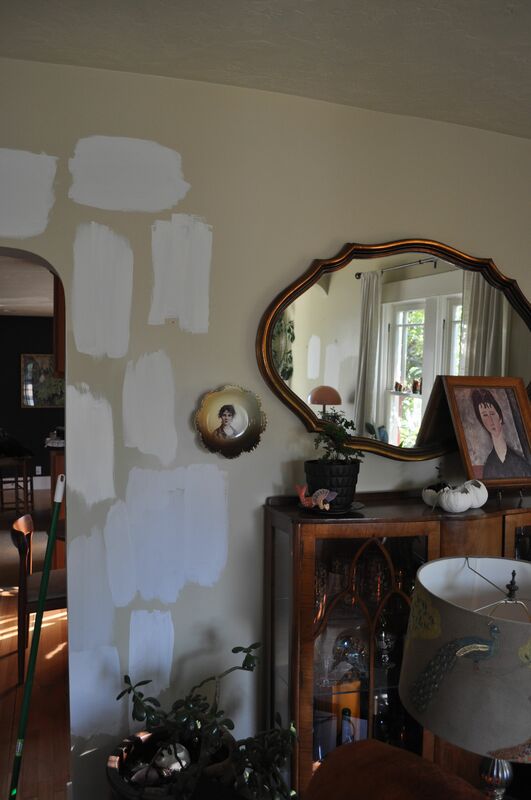 Please send good thoughts that I might find a good paint color for our living room or, barring that, that I might find the strength to stop painting if I notice after one coat – or hey! even one wall! – that it’s going awry. Also give Mera the good grace not to say ‘I told you so’ about Blackened looking blue, even though she did tell me so. Thanks! Hang in there Katie, I’m sure that it will be lovely when you’re finished—and you’ll have more than perfected your technique! :) I wonder if you should do a coat of white over the blue so that whatever you cover it with doesn’t pick up a bluish cast? Good luck! 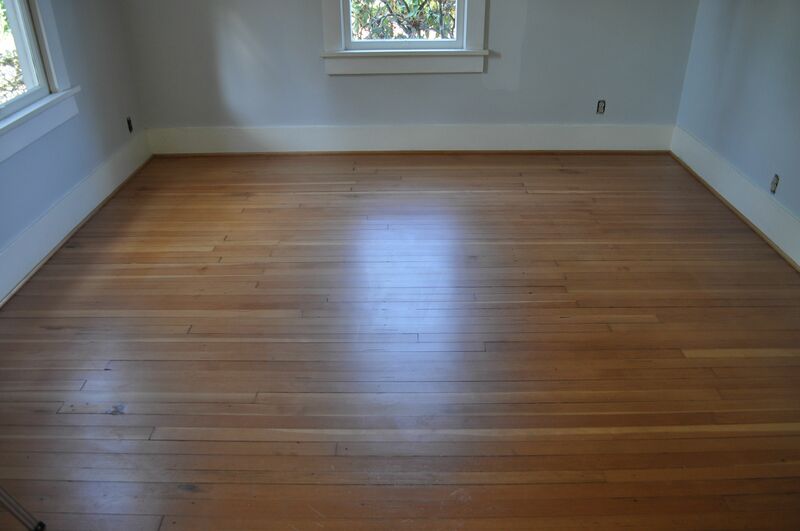 The floor looks great! If you ask me (although I notice that you didn’t) I think a creamier color would be better than the bluish grey. There’s one sample there near the door that looks promising. But maybe by now you’ve solved it and are happily drinking tea in your finished room. Best of luck – looking forward to the next progress report. Alas, Carol, this post was written in real time and the walls are still powdery blue. Thanks for your input, new color goes up tomorrow! I know you posted this two years ago, but I’m currently in the same boat with Blackened. It looks so gorgeous in all the photos I Google, but I swatched it over my boys mint bedroom (was mint when we moved in) and it looks lavender! Now, I know it has a slight lavender undertone… but I was heartbroken. 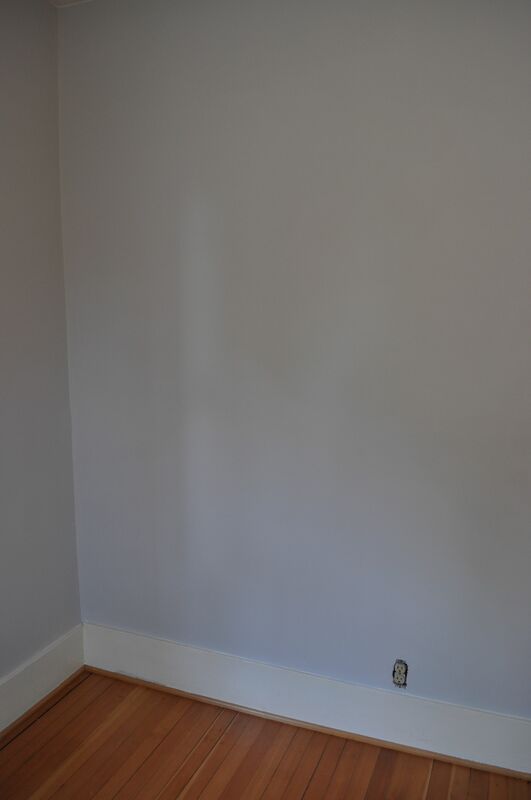 So, I’m going to head to Benjamin Moore and buy primer and prime the entire room. Maybe Blackened will look more light grey then? I doubt it. But the mint is really throwing it off. I was hoping to get Blackened colour matched, but I may just have to find something at Benjamin Moore. I totally feel you on Blackened! I just couldn’t seem to make it work. 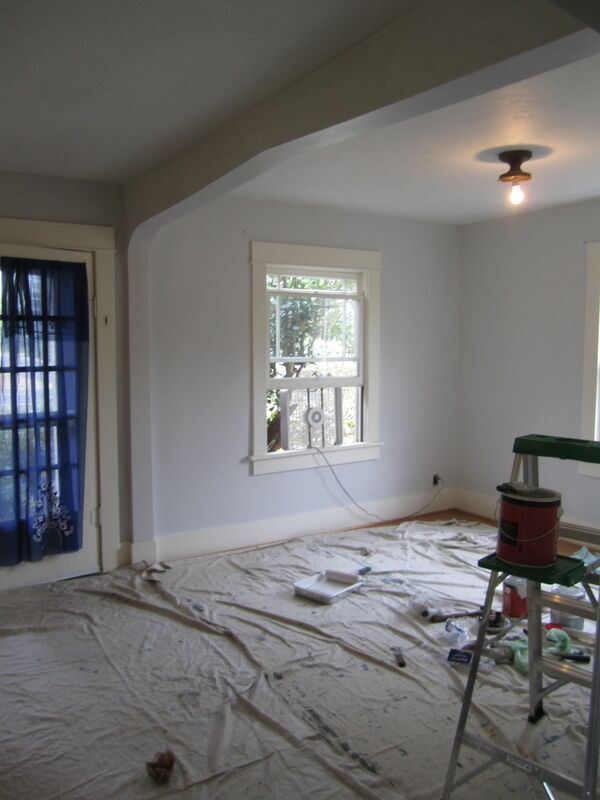 It did help when it was next to bright white trim, so perhaps when you get rid of them mint it will look better. In this post (http://www.redhousewest.com/before-after/if-id-only-had-a-crystal-ball/), I shared the paint color I ended up using–Miller paint’s Crystal Ball in their Colorevolution line –it is perfect and everything I wanted in Blackened. I’m not sure where you are though, and I think it’s only available on the west coast. Best of luck with your paint hunting!